Scouts wishing to complete a Merit Badge should contact the Merit Badge Counselor in the troop for that badge. If there is no counselor, please contact our Scoutmaster. If you would like to volunteer to be a counselor for a Merit Badge, please contact our Scoutmaster. Note for non-troop 2 visitors. 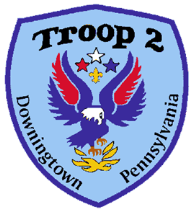 We occasionally get inquiries from scouts from other troops about our merit badge programs. In general, our merit badge counselors are available to help scouts from other troops as well.